Our Engineered Stair Nose is designed to work with your flooring for the perfect finish every time. 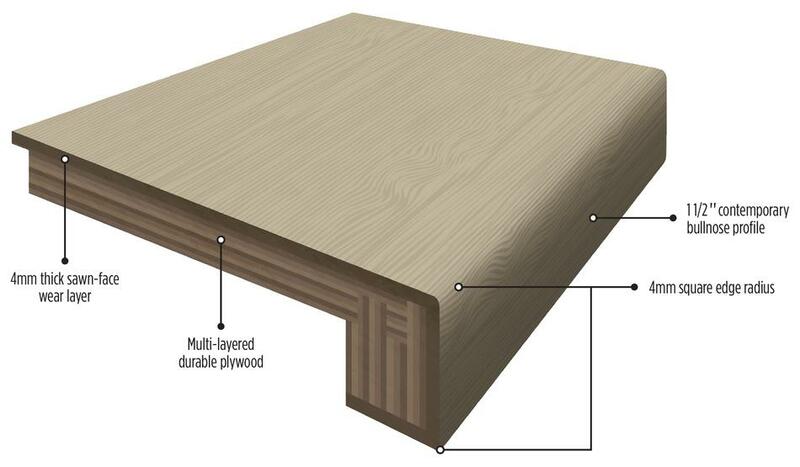 Designed to fit 1/2", 9/16", 5/8" & 3/4" flooring. For 5/8" & 3/4" floors, factory installed shims are applied to bring the stair nose to height. These nosings custom blend with the manufacturer's flooring and come in 84" lengths. Will be offered in European White Oak, White Oak, Maple, Pecan and Walnut. We strongly advise NO nailing or screwing of this profile for installation. We highly recommend using the Wakol MS 245 Montinator adhesive we sell on our website to secure the profile in place.